Founded: 1977 by Michael S. Burg. Attorneys: More than 60 trial lawyers who and provide nationwide legal representation. We’re based in Colorado, with offices in Arizona, Ohio, Wyoming, New Mexico, and Florida. Mission: To be Good Lawyers. Changing Lives®. To change peoples’ lives for the better by fighting for them in court and getting fair compensation for their injuries. To give back to our local communities. When you find yourself in need of legal representation, finding the right lawyer can be a daunting task. How do you even begin to find the right needle in that haystack? Do you pick the big downtown law firm because bigger has to be better? Or do you go with the sole practitioner operating out of a suburban strip mall because you think you’ll get more personal service? Or do you work with a law firm that’s spent decades fighting for the underdog? That was Michael S. Burg’s plan when he founded Burg Simpson in 1977: to fight for the little guy, the average citizen who is going up against a more powerful entity, i.e. the large insurance companies and big corporations. Burg Simpson’s litigation attorneys have argued countless cases for more than 40 years, sometimes for hundreds of people, and occasionally representing hundreds of thousands of clients in class action suits. The cases that mean the most to Burg Simpson Eldredge Hersh & Jardine are the ones taken on behalf of the single client. As Michael says, the people who come to him genuinely need help. They have nowhere else to go. 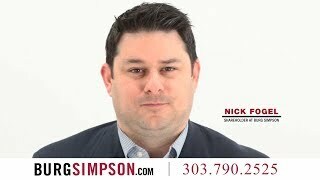 Burg Simpson is a law firm committed to helping injured people rebuild their lives after a serious accident or injury. Our trial lawyers have handled nearly every kind of injury or wrongful death case. 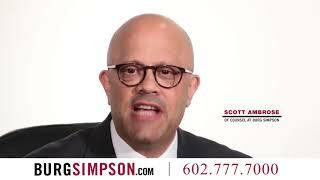 The team at Burg Simpson is convinced no other firm has the resources, nationwide reputation, or proven track record of success when it comes to helping victims and their families. If you would like to work with us, please fill out our Free Case Evaluation Form above. Burg Simpson is a law firm with more than 60 trial lawyers operating out of seven offices in Colorado (Denver and Steamboat Springs), Arizona, Ohio, Wyoming, New Mexico, and Florida. With dozens of paralegals and an experienced support staff of legal professionals, we are able to offer legal representation anywhere in the country. We are convinced that all any of us really have is our good name. We have worked long and hard to build a reputation as an honest, committed law firm. We are dedicated to fight for our client’s legal rights and hold negligent corporations and individuals accountable for their harmful actions—or inactions. At the end of the day we simply want to be “Good Lawyers. Changing Lives®.” We do what we do to change peoples’ lives for the better by fighting for them in court and getting fair compensation for their injuries. It is also important for us to give back to our local communities and work closely with dozens of charitable organizations, because doing right is better than doing well. Over the last 40+ years, we have earned more than $1 billion in verdicts, settlements, and judgments, while securing more than 200 individual recoveries in excess of $1 million each. *Each case is unique. Past results do not guarantee, warrant or predict future case outcomes. At Burg Simpson, we have built our practice and a strong reputation on a culture that values collaboration and referral arrangements with other law firms. We know how difficult it can be to find partners you can depend on. 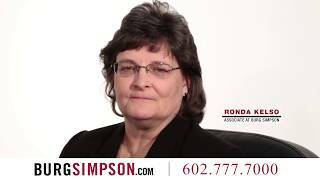 That’s why it is a top priority at Burg Simpson to develop co-counsel relationships with other law firms. To date, we have paid more than $50 million in co-counsel fees to other attorneys. More importantly, our co-counsel partners produce revenue from cases outside their traditional practice areas. We’ve added money and experience to their bottom line. One area where we have been particularly successful has been mass tort litigation, a complicated area of law that can be cost prohibitive and beyond the reach of most firms. Co-counseling your next drug or medical device injury case with Burg Simpson will allow you to overcome those hurdles while you generate revenues from cases you may otherwise have turned away. Since his admission to the bar in 1976, Michael Burg has argued more than 175 jury trials. In 2016, he earned induction in the national Trial Lawyers Hall of Fame. He received both the DU Law Stars Outstanding Alumni and the Clarence Darrow awards in 2013. The National Trial Lawyers organization, which he presided over as president in 2010, named him among the Top 100 Most Influential Attorneys in the country. The Legal 500, an international network of guides to top lawyers, elevated him further, naming him one of America’s 50 Leading Trial Lawyers from 2012-2017. Closer to home, Colorado Law Week named him Lawyer of the Decade in 2010. Michael is also the author of his 2017 novel, Trial by Fire: One Man’s Battle to End Corporate Greed and Save Lives. Former U.S. Sen. Alan K. Simpson, R-Wyoming, is the “Simpson” in Burg Simpson. Alan served in the Senate from 1979 to 1997, where he rose to become the assistant Republican Leader. Alan also helped found the Wyoming Trial Lawyers Association while serving with several public service groups, such as: the Continuity of Government Commission, Americans for Campaign Reform, the National Commission on Writing, and the Advisory Board of Common Good, a coalition dedicated to legal reform. Alan, a former member of the American Battle Monuments Commission, also managed to work across the aisle. He served as co-chair for President Barack Obama’s National Commission on Fiscal Responsibility and Reform. His bipartisan work ethic also led him to work on the Iraq Study Group, a 10-person bipartisan panel Congress assembled in 2006. Congress charged the committee with assessing the situation in Iraq and the U.S.-led Iraq War and to make policy recommendations. As trial lawyers, we recognize that our role outside the courtroom—and in the community—is even more important than out role inside the courtroom. We subscribe to a robust culture of community service and a fervent drive to make a difference is part of the fabric of our firm and instilled in all of our employees. It’s nearly impossible to answer all of your questions here. So we’ve compiled an FAQs page to address as many of them as we can. Whether you’ve been injured in an accident or wronged in an unfair business deal, all of our lawyers are here to help. Contact us right now by filling out a case evaluation form at the top of this page to discuss working with us!